Many native born American artists and artists who immigrated to this country recognized a unique quality of light illuminating the American landscape. A number of these artists responded within the aesthetic boundaries associated with the Hudson River School. But there is an offshoot of the HRS which has come to be known as the Luminists. John Wilmerding, an art historian scholar who was intrigued by the Luminist painters and wrote extensively about their work and collected many of their paintings and drawings for his own personal collection. 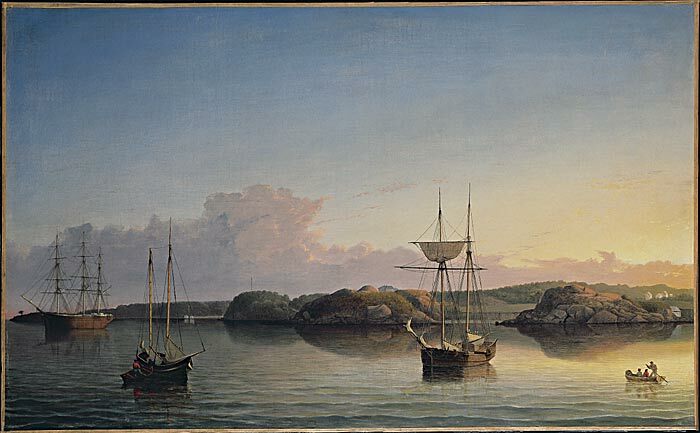 In a catalogue essay on American Luminism, Professor Wilmerding wrote: “Fitz Henry Lane, known as a marine painter, based this painting on drawings he made from the center of his hometown Gloucester’s harbor. The western shore was believed to be the place where the French explorer Samuel de Champlain landed early in the seventeenth century. In a letter Lane noted that he had been given “an order for a picture from this point of view, to be treated as a sunset. I shall try to make something out of it, but it will require some management, as there is no foreground but water and vessels.” Lane “managed” the painting beautifully, animating the foreground expanse of water with various large and small vessels arranged in a zigzag pattern that is mirrored by the contours of the shore.” What are your thoughts on Lane’s interpretation of the “peculiar American light”? well there is no real way to say peculiar light source. Lane has a nice piece here. The foreground is the water and needs to be seen that way. If we can reference other artists we can see Turner had some amazing light sources and used them to treat the foreground middle ground and background. This can also be see in work like Rothko as well, even though he is not a landscape artist. I think he was just viciously trying to deal with the picture plane in such a way one was unfamiliar with. I think if we look close enough we can see all these elements and see them well. The light was just a struggle for the new way of work. I want to add more to this. I see the level of light is important. When referring back to the Rothko idea I feel there is luminism there as well. As a picture the idea of light is a huge step to take. As a sense of peculiarity I think its something we put on it as to elevate it. I don’t think that American light differed in a more peculiar way but instead American land was viewed differently. A new, less tainted landscaped enabled artists to view it in a new way. American luminist’s were paying close attention to characteristics of light as were impressionists. They differed because luminist’s focused to hide brush marks and refine form where impression did just the opposite. Many of American landscapes were calm and undisturbed which artists could show the tranquility of such places. This also made the feat of painting such views difficult. The statement that Lane “managed” the painting is probably stemmed from the shear difficulty he was faced with interpreting and distinguishing the middle ground from the background and foreground. He cleverly placed the vessels on different planes and depicted them in varying sizes which gives the viewer a since of perspective. He also displayed a strong sense of directionality of the lowering sun as well as dissolution of light that fades at the left. What makes American light “peculiar” compared to the light in the rest of the world? To me the only peculiar thing about it is that it was something new for artists to focus on. It was something that had not been studied before, so artists needed to really pay attention to what they were looking at so that they were able to convey it in the way they needed. Lane handled the composition wonderfully. The grounds of the compostion are easily identified and the reflection of the sky in the water is handled nicely. Many of the landscape artists were interested in the spiritual connection between the land and God. The luminists were also interested in the spiritual meaning of light to the rest of the world. Landscape was a component of their paintings, but the light was the central focus. The paintings are very delicate and simple, and seem to truly admire nature. I am not too sure why the light is “peculiar” but maybe perhaps this is the first time people saw the light as a spiritual element. I don’t think the light is peculiar, I think it’s beautiful. My only interpretation of peculiar would be that Lane thinks it looks weird because he created the light source himself. I think Lane did an amazing job of interpreting the sunset when it wasn’t really there. I don’t understand why he says that he has no foreground when obviously the water and the boats are his foreground. This painting is magnificent and a great example of luminism. I agree with the other comments on here. It is not the light source that is being described as “pecuiliar” but more the fresh landscape that is the American landscape. It may also be that the way light hits certain landscapes is what is truly captivating as oppose to the light itself. Lane’s landscape painting and interpretation is quite successful. He painted the vessels and the body of water skillfully; there is an apparent sense of overall balance. The colors are mild but still convincing. I think Lane’s thoughts on constructing sunset, illuminated paintings are agreeable. He knew it would be difficult to create such a picture because of the lack of a foreground, even though he ended up being very successful in his attempts. It wasn’t important for the luminist artists to see shore lines and wave lines, it was more important to feel the “aura.” By taking on that point of view, Lane was able to portray the great expanse of water clearly and create a moment frozen in time. This effect of light was mostly seen as a unique American characteristic in which imagination and illusion were used to capture God’s presence rather than typical HRS landscapes. I think his paintings of the Boston harbor are really beautiful. The luminist paintings really do make the viewer feel a sense of peace and calmness. The paintings were compositionally different because of the concept of sky meeting water rather than traditional wilderness landscapes, but so stunning. I think that different regions do have a different quality of light. I am from Hawaii, and the light there is very different. After I moved here, I saw different intensities and tonalities than what I was used to. I rarely used sunglasses in Hawaii, and in Las Vegas I can’t go outside without them even on a cloudy day. When trying to photograph plants in my garden, I am very aware of how blinding the Las Vegas summer sun can be. There definitely is a peculiar Las Vegas light that goes with this big expanse of sky and its high clouds. Yea i agree with you, the sun here is piercing while the sun in hawaii is just right! The light in the northern lights are amazing and awesome to look at. The play of light whether it is in a photography, painting, or any other form of medium is something artists play with constantly. A piece with good or bad lighting can make or break a piece. I think that the light is something that intrigues everyone and I am glad that these artists acknowledge the light and strived to make it become the focus of their pieces. I am a fan of this painting because of the reflections that are painted in the water. This is one of the earliest paintings that I have noticed with that style of art. I think it is realistic in the sense that it doesnt have a bright sun over the harbour because the early morning scene like depicted here is normally overcast. Looking at this picture I feel like it is about 7am and the picture feels like it should be moving. I think that the moment the artist picked to portray was the thing that made the light so beautiful. It might have been viewed as “peculiar” because Luminism was a new stylistic expression. However, I think Lane made the composition very interesting and successful in the way he arranged the boats and his masterful execution of the landscape. Lane did a beautiful job making this sunset up, one can tell that he studied sunsets and landscapes for a period of time coming to the United States. With the changes of landscapes everywhere and different environments, sunsets and sunrises change completely. Without knowing that he made that sunset up, most people wouldn’t know that he made the sunset up himself. I feel like Lane was too hard on himself in the statement. Perhaps being the artist he is aware of any “flaws” that the viewer doesn’t catch onto. Only he knows he’s potential and goals on his paintings- to everyone else this piece is a masterpiece. The waves in the water are what pops out to me the most as closet the viewer. Overall, he made the painting extremely believable and leaves his viewers wanting to see more of his talents. My thoughts on Lane when looking at this painting, is that he truly studied the different patterns of light throught the day, which is important if your creating a photograph or painting that requires a particular use of sunlight. He seems to have captured every part of the sunset in a manner that does not overwhelm the vessels, but rather done perfectly as to see the ripples of the water and reflections of the landscape to give the appearance you were there within that hour. A painting beautifuly done by Lane, despite being concern about the light and foreground. For when you look at the painting you could never tell he was hard on himself in trying to create an accurate picture of vessels at sunset, based on the way he used colors and brushstrokes to bring out the subject, as he so grealty captured here. Luminism was a new idea at the time. The painting style was somewhat unexplored. This is why Lane clearly had to study the sunset in order to really understand how to portray it in this manner. It turned out perfect. I do not think it is peculiar at all but it was a brand new thing. Lane did not know how it was going to turn out. I think part of it had to do with his tough childhood. Through his hardships, he was able to find and rely on deep spirituality. He perfected the luminist techniques and was able to depict seascapes resulted not from a desire to follow the fashion of European peers but, rather, from a deep-rooted interest. No one could have painted the extraordinary beauty of the azure coasts of New England with the expressiveness and luminosity of Lane. I definitely think the light is ‘peculiar’, perhaps because we are so used to it, we are desensitized to it, but I can how such a vast horizon that hadn’t been experienced before, can be peculiar to a person and I think Lane handled it extremely well. I think the peculiarity about it, and what intrigued the Luminists, was the way in which you could represent depth with nothing but light. This is what made Luminary landscapes so difficult but so beautiful at the same time. Lane’s effective way of portraying this type of ‘peculiar American light’ successfully is what makes this painting so beautiful and breathtaking. I think that Lane was brilliant in using the “peculiar” light to add a sense of density, mass, as well as movement and depth to the foreground of water. Although you sense the water as a large moving body, it is so calm the it is emotionally kinetic. It gives the water a characteristic so perplex and mystical that is it magnificently breathtaking. It is the luminous relationships of elements of the painting which makes the light peculiarly American. I agree that “peculiar” refers to the new landscape more of the light itself. However, Lane was also very sensible and drawn to the changing effects of time of day and atmosphere, as witnessed in many of his storm-approaching seascape paintings where clouds play a crucial role. As opposed to the “old world”, the American land at that time was relatively untamed. I believe this and the huge open space the new land offered gave Lane a great opportunity to observe the beauty of light, especially during sunrise and sunset. Lane’s interpretation of the “peculiar American light” is very intriguing and extremely beautiful. The way he uses the light to create this calm, peaceful, and in a sense, spiritual mood is amazing. He is quite successful at manipulating the landscape he is trying to portray and his use of using a few elements to reflect this “peculiar” light is intelligent. By using such a simple landscape as well as placing simple objects in particular places within the environment enhances the effect of the light as well as the mood. As some individuals said in their own posts, this light is not peculiar whatsoever, but rather breathtaking if anything. The notion of ‘peculiar American light” personally harkens to mind the works of the impressionists. The plays of light with sunset and sunup etc. remind me of how plein air artists allowed the interchange of lighting to inspire them to paint creatively. I always like the color palates of sunsets– the cool tones and pastels make for beautiful pieces. Combined with water and reflection, the top and bottom of the piece begin to mirror one another making the center line of the painting the subject. I think what he means when he talks about the “peculiar American light” He is talking about how different it is to paint the water than it is to paint the land. On water, the light is reflected. The water is also a moving thing. So just as the light is changing, so is the water which moves the vessels. This brings in a lot more factors than if he were to be painting some stationary hills or mountains. I think that the light from the sunset combined with a largely untouched by man natural landscape creates a beautiful and different display than what most are used to in marine paintings. Many of the marine paintings I’ve seen that were painted by Europeans include bustling, industrial areas, but Lane’s paintings portray a serene and yet-to-be touched foreign land that accurately reflected a still young America. Perhaps the peculiar American light originates from the peculiar beginnings? Is it the way in which the sun shines on American soil that makes it distinctive, or is it the hand of the artist that paints such astounding luminosity? Perspective gives way to reality. In my eyes, if the perspective of the artist is bright, with a spirit of challenge and untamed optimism the work will be similar. Lush sentiments will follow by way of demonstrated visual skill.